7:17 - What's it like playing with the old CLG core again? 11:36 - What's the relationship like with Liquid's Academy team? 17:25 - How do you feel about the current meta, especially Stopwatch? 25:17 - Have best-of-ones changed anything for players? 35:53 - What teams are you afraid of? Who's underrated? Jake "Xmithie" Puchero is about as close to a grizzled veteran as you can get in professional League of Legends, being a staple in the NA LCS ranks at the jungle position for years. He spent more than two of those years as part of Counter Logic Gaming, played with Immortals during last year's Summer Split and has now landed with Team Liquid in the wake of NA LCS franchising. Xmithie spoke to theScore esports Podcast about reuniting with some of his old CLG teammates, the current jungling metagame and how he expects a Team SoloMid resurgence later in the split. The transition from Immortals to Liquid was a reunion for Xmithie with AD Carry Yiliang "Doublelift" Peng and mid laner Eugene "Pobelter" Park. The 26-year-old jungler said he's enjoyed being back with his old teammates, but said Doublelift in particular has made some positive strides since they last played together. "In-game he kind of changed for the better, like he's more calculated now. And then I learned a lot from him, like lane management, or like wave management, [I've] learned a lot," said Xmithie. 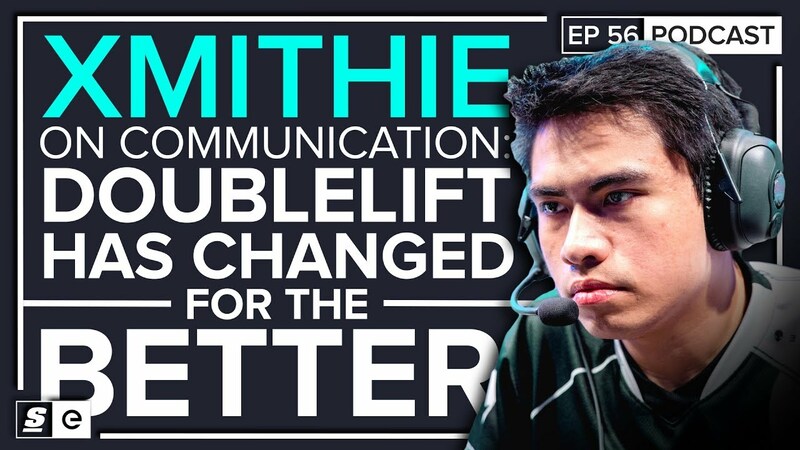 Xmithie talked at-length about Doublelift's communication skills and what he looks for when talking to teammates. He said that Double's straight-forward and open attitude works because it allows Liquid to clear up anything issues instead of holding them in. "It's good and bad I guess, because like sometimes he lets out emotions that he doesn't really need to show. But sometimes it's good also because you guys can hash it out like literally right then," said Xmithie. "And he just doesn't hold his emotions, which is really good for a team environment because you just want to have no problems going to LCS." One of the biggest conversations surrounding the LCS as-of-late has been the way Perfect Timing Rune, as well as other factors, have impacted the metagame in NA. With every player having the option of getting a free Stopwatch, the early game in NA has generally slowed down. That said, Xmithie likes the way Stopwatch impacts the game. "I actually like the stopwatch meta because usually fights at level six are like more entertaining," said Xmithie. He remarked that it makes fighting early more tactical and less about who can one-shot who. He also said that he expects patch 8.3 to result in less roles selecting the Perfect Timing Rune. Despite the slower pace of the Stopwatch meta, Team Liquid holds the quickest average game time in the NA LCS, sitting at a blistering 33.2 minutes as of publication time. Xmithie chalks this up to their strong team-play and macro game knowledge. "Our team is just really good at understanding our win-condition. So when we, like either we split or we try to 5-man and just end the game, everyone's just really good mechanically," said Xmithie. "If we just play our fights right, there was no way that we could lose." Xmithie also revealed who he thinks are the most underrated teams in NA so far, and he made one thing clear — don't sleep of TSM. "I've always been like, even though they're down there I still think that they're going to be in the semifinals or the grand finals so I'm always looking at their progress and like hoping that our team improves faster than them," said Xmithie. "Because like, I still think their organization is like really good, so they still can be the best team."